Although this doesn't explain much about the game, I thought perhaps there was something cool underneath the dark, mysterious, and maybe even a little creepy slab of marketing . After playing it for the first time nearly 20 years after its release, I'm happy to report that in addition to being a solid mid-generation PlayStation game, it also has a terrific atmosphere and art direction that lives up to its marketing campaign. 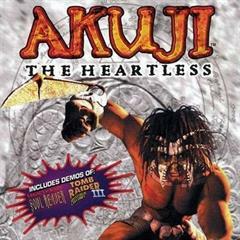 Akuji the Heartless is often referred to as an "action adventure" game, but it felt more like a traditional 3D platformer to me. And since it was released in late 1998, it was right in the middle of the whole 3D platformer boom with other games like Banjo-Kazooie and Spyro the Dragon. While most of its competition featured cute mascots and cartoony aesthetics, Akuji was much, much darker. The story starts out with Akuji having his heart ripped out on his wedding day. After arriving in Hell, Akuji pledges to have his vengeance and from there it's up to you to slay tons of nightmarish enemies and topple some tricky platforms to help him reach his goal. And those are really the only things you do in this game: kill stuff and jump on things. So, you know, standard platforming. Even though the game doesn't deviate too heavily from the core mechanics of a platformer, it has a few nifty tricks up its sleeve. Let's start with the combat portion of the game. Akuji has blades attached to his arms that can be used for close-range melee action. The melee combat isn't very deep, it's pretty much just mash the attack button until the enemy dies. There's an "uppercut" kinda move where you can attack enemies in the air, but I found it rather annoying to use. The game doesn't allow you to fully customize the controls, but it does have a few different options. I ended up going with the default set, which binds melee attacks to the circle button. (Side-note: I'm not sure I've ever played a PS1 game where the primary attack button was circle.) The jump button was "X", which is pretty standard and felt fine. But to perform that uppercut I mentioned before, you have to either press the attack and jump buttons at the same time or hold down attack and then press jump. I found that neither option was comfortable and I would struggle to pull off the move AND hit my target AND not plummet to my death. In addition to melee combat, you can also find spells throughout each level to use. Some of the spells were very useful, but I found a number of them to be difficult to use since I couldn't hit anything unless I went into first-person mode (there isn't any sort of lock-on system like in Zelda, so it's all up to you). The problem with first-person mode is that you just get hammered by your enemies when you're trying to line up a shot. To make matters worse, the analog control was very sensitive in first-person mode and I had to switch to the d-pad to accurately find my target. Despite the cumbersome / touchy controls, the game is pretty forgiving overall in terms of combat. You're never really overwhelmed by enemies and there are health pickups throughout the level. At the same time though, there are plenty of enemies to kill and you certainly won't just waltz through the game unimpeded. And the combat, especially the melee portion, is very satisfying. I had a blast shredding through the twisted baddies this game threw at me all the way to the end. The combat in the game definitely deviates from a traditional 3D platformer and you're probably wondering "is this even a platformer?" Oh my, yes. You will be jumping all over the place in this game! I found this portion of the game to be much more difficult than the combat since one mistake could send you flying off the edge of the map and back to your last checkpoint (which could be a pretty big deal in most levels). I had several instances where I had to put my controller down to wipe away the sweat building up on my hands, which is always a good sign for this type of game. So yeah, you jump around different platforms, some of which are giant spinning blades, flip switches, climb ladders, jump on trampolines, slide down ziplines, etc. It's all pretty standard stuff, for the most part, and while it's fun throughout, it never really advances beyond what you see in the first few levels. The landscapes just get bigger and the jumps more death-defying, but it's very samey. One area that this game deviates from the collection-heavy platformers like Banjo-Kazooie is that there really isn't much to (optionally) collect. There's a few standard ones like health and extra life pickups, plus spells, which are essentially ammo pickups. Beyond that, you have some voodoo dolls, which if you collect enough of, you'll permanently increase your health meter. 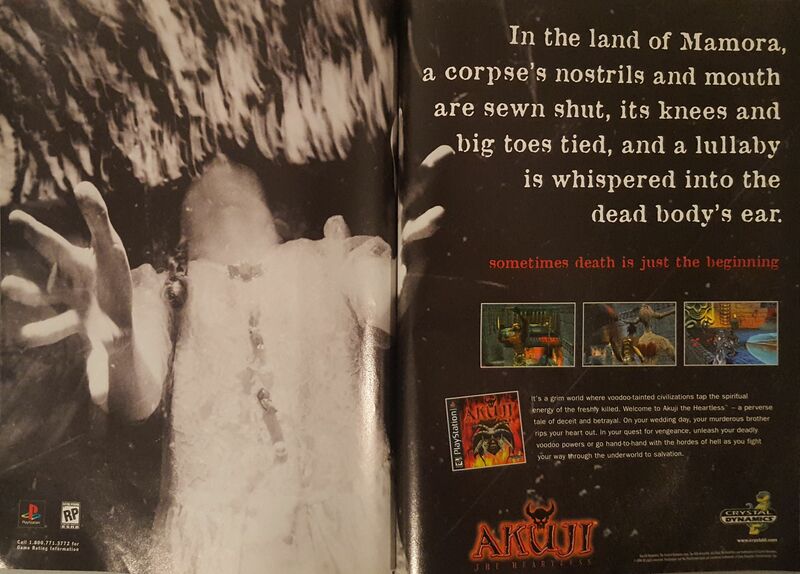 The main collectible though is the ancestors, which are more or less jiggys from Banjo-Kazooie. There are four in each level and you're required to collect a certain amount before you can move onto the next section of the game. For the most part, they're out in the open and easy to find if you explore a little. I had trouble finding a few, but I managed to get all 52 of 'em without too many headaches. Some of them will make you question the risk / reward aspect of things, given their proximity to the last checkpoint you crossed. Those were definitely a source of excessive hand sweating. Okay, so we have some clunky controls and repetitive gameplay. That sounds bad, but I should really point out at this point that Akuji is just a fun game. Sure, you don't advance beyond the core elements of the platform genre, there aren't any mini-games or anything like that, but I had a blast with it from start to finish. Even though the gameplay may not be groundbreaking, there's another element to the game that really separates it from other games in the genre. As I mentioned before, Akuji has a rather dark story to tell and the game has some fantastic artwork / design and brooding atmosphere that makes it quite unique. You're waltzing through Hell here, so you won't find any fuzzy bunnies or pretty flowers. Instead, you'll find lots of blood splatters, meathooks, crawling torsos, rivers / pools of blood / acid, and lots of other macabre. The game has some solid graphics with a reasonable framerate and minimal loading times. Even though it's a dark game overall, it has some pretty cool lighting effects and at times colorful graphics (in a Hellish kinda way). The camera was actually decent, which is always a mixed bag when dealing with 3D platformers. My only complaint with it is I wish I could've used the right analog stick to control it, but you're limited to L1 / R1. A special note should be made about the music in the game, which is excellent and absolutely perfect for the game. It has a very tribal feel to it that really helps build the atmosphere. It even picks up tempo when you engage in combat, which helps add to the intensity. Akuji the Heartless has been sitting on my shelf for so long and I'm glad I finally played through it. It's a solid PS1 platformer with a unique setting and some excellent core gameplay. Although it wasn't a huge hit, I can't help but feel it at least somewhat helped mold the game that Crystal Dynamics would release the following year: Legacy of Kain: Soul Reaver. The game isn't available digitally and without a PC port, it's highly unlikely it will ever get one. It's a very inexpensive game though, so if you still like to fire up your PS1 and want something a little different, this is a great option to look into. I got a solid 8 hours of gameplay out of this one and would recommend it to any fan of the genre.